Next Arma Hobby plastic model is Fokker E.V in 1/72 scale. One of the classic constructions of the end of the First World War. The aeroplane did not help the Germans win the war, but played a great role at the beginning of Polish aviation. See more! 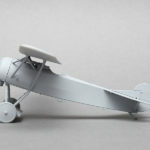 In the First World War, when a large number of aeroplanes first time took part in the history of human struggles, there was a great development of war technology. One of the precursors of the mass-produced aeroplanes was the Dutchman Anton Fokker, supplying the German Kaiser’s Army. The Fokker D.VII biplane and Fokker E.V were his latest achievements during the War. The second of them had a specific design. With fuselage made of steel tubes covered with canvas, she had one thick wing covered with plywood. The aerodynamic properties of this design allowed for outstanding performance even with a weaker engine. Unfortunately, the poor quality of the wings supplied to Fokker by the German co-worker caused the machine to be grounded. When an improved version of D.VIII appeared, the war was over. The sister aircraft, the D.VII biplane, became the best German fighter of the war. Few of the E.V and D.VIII planes were either captured or bought after the war for Polish aviation. The most important was the 001, piloted by Ltn. Stefan Stec. 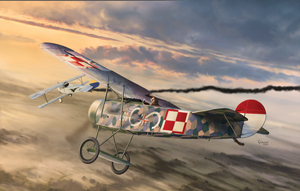 The personal emblem of this pilot, from the time of his service in the Air Force of the KuK Austro-Hungary (white and red chessboard on fuselage sides), became a sign of Polish aviation. On the plane Fokker E.V No. 001 Stec received the first air victory in defence of Lvov. During the air-fight on April 29, 1919, he damaged the Ukrainian Nieuport piloted by the Austrian ace Franz Rudorfer. 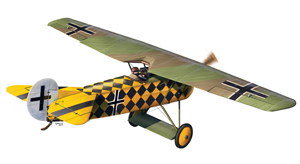 Why Fokker E.V model kit? Recently, the attention of the Polish modellers has focused on the aircraft of the 1939 War. But we chose Fokker E.V for two reasons. The first is a test on a small model of what we learned by developing the PZL P.7a model. Second, no less important reason is the role of this aircraft at the beginning of Polish aviation and the forthcoming celebration of the 100th anniversary of Poland Independence (11th November 1918). Work on the model began with the collection of the best available documentation. Courtesy of Achim Sven Engels (Fokker-Team-Schorndorf) we received the materials from which the Fokker E.V flying replica was constructed. After designing the plastic parts, we ordered a 3D print. The trial assembly showed how the model parts go together, allowing us to catch minor bugs. We could also test fit print photo-etched parts and decals. We also found a way to properly assembly the undercarriage, without fear of skewing (wheel legs and wheel axes are to be glued in 4 points once) and without simplifying the model. Assembled model from 3D prints. A careful eye is not needed to notice the traces of the layers and typical for such prints twist of long sections. Another challenge was the canvas printed in polygons so-called Lozenge. In the design, we have created an imitation of the canvas fibres that translates into the pattern of polygons. 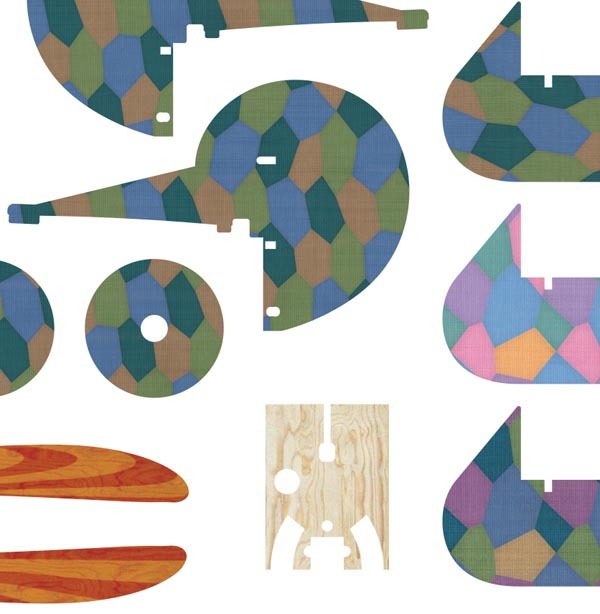 Not only Lozenge is included in the decal but also a plywood pattern for visible panels and propeller blades. Two sets, Expert and Junior, will be available. In the Expert set you will find a two sheet Cartograph decal with Lozenge pattern printed on the highest world level. Decals will allow practically every variant of painting with four colour Lozenge, with tailplanes in 4 or 5 colour Lozenges. The Junior set model will be easier to build, with decals in geometric patterns. This is not a decal to the 1/32 model. It’s just a Lozenge pattern and wood designed for Expert set 1/72 scale. The effect is at the edge of the printing possibilities, even with such manufacturer like Cartograph. We do not know if it will come out well. As soon as the printed decals reach us – we’ll show you pictures! 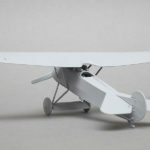 When will Fokker E.V be released? We plan to release the model on December 7, 2017. After talking in the tooling workshop, we already know that it is 50% possible. The worst predicted variant is a delay of about two weeks. Perhaps we should pause with the announcement. However, we felt it was better to inform you earlier so that you were prepared “for the best”. In the next two weeks, we will be providing more information about the model. We will show the rendering of parts, more about the paintings contained in the boxes, the plaques and the history of the aircraft. Please share the information on blogs, forums and social media. Below you can ask questions and comment on the model. I’ll get an expert-set for certain. Looking forward for more releases in 1/72. Will it be possible to buy the PE separately to convert the junior set int the expert set ? Or the opposite, to buy the decal sheet of the junior set to put it on the expert set ? Another person waiting for a 1/48 version of this very aircraft in Polish markings. Perhaps do some more Polish markings? 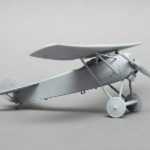 This is great news, I always like to see WWI a/c released in 1/72nd, especially when done with this level of quality. In any event, I’ll definitely try to order one of these. Nice surprise. Was thinking which kit will come out next. Didn’t think about this one ,good choice. I will get one maybe a second in Polish markings of coarse. How about decals for the Nieuport Stec damaged to go along with the Fokker? Didn’t know it was Rudorfer. Going to miss the resin parts and kits a little but WW1 planes Poland used in plastic sounds better. Sign me up for about three of them! Love the subject matter and 1/72 scale works just fine on uncomplicated builds like this. I’d take a few more if you went up in scale too (1/48, 1/32). Any idea what the motor will be, resin or injected plastic or both? Thank you for warm words! Engine is injected plastic. Some nice features are included. Please stay tuned – we will show some details on our blog soon. what a surprise, this is indeed great news. I am in contact with British suppliers regarding the Lozenge pattern and decals for various E.V models. They know and telling me that currently there is no kit in 1:72 available. I will get one for sure. This will be a VERY popular subject because of how unique the aircraft is. My eyes went wide looking at your kit having only seen some photos many years ago. I love WWI and WWII Polish aircraft and will soon be doing a feature build of a PZL P42 Trainer. The 70012 Expert set would be my choice and without even having one I can see that great thought was put into the kit with the modeler in mind! Fantastic idea with the wood panels and propeller decals! If you have a sample for review and build features than please let me know. It would be my pleasure to shine the spotlight on your work at ArmaHobby. I work in 1/48 scale,will you do any kits in that scale? In future – yes. At now we need to start with 1/72 only.